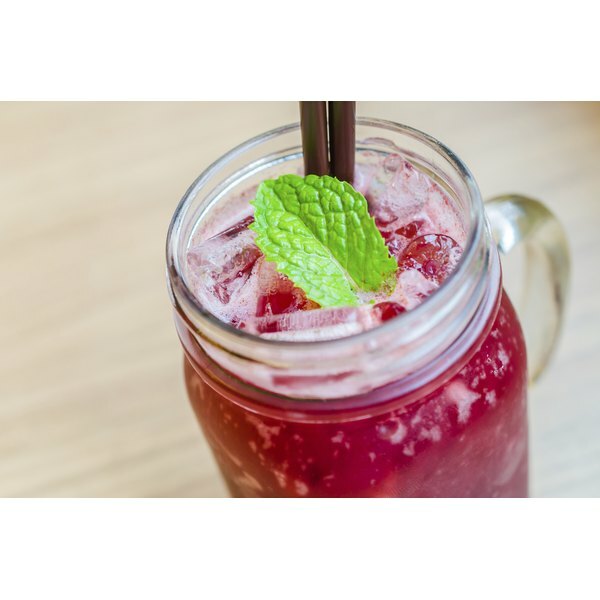 Although red cabbage juice is not sweet-tasting like fruit juices, you may find that drinking this beverage has some advantages. Red cabbage juice provides a concentrated form of red cabbage, so it is rich in certain nutrients that you may find beneficial for your diet. However, red cabbage juice does lack some nutrients, so it's not ideal for all diet plans. If you're dieting, you may find that red cabbage juice is a better choice than other types of juice because it's low in calories. An 8 oz. serving of red cabbage juice contains just 48 calories, which is much lower than the amount of calories in fruit juices such as apple juice, which contains 117 calories per 8 oz. serving. If you switched from drinking two cups of apple juice per day to two cups of red cabbage juice, you'd consume 994 fewer calories in one week, enough to lose more than 1/4 of a pound. Red cabbage juice contains no protein, which can potentially aid in either gaining or losing weight. Your body uses protein to build and repair muscle and other tissues, so it's helpful in gaining weight. Additionally, protein is more filling than other nutrients and promotes increased calorie burning, so it's preferable for dieting, according to the May 2008 edition of "The American Journal of Clinical Nutrition". One advantage of red cabbage juice is that it contains low amounts of sugar. An 8 oz. serving of red cabbage juice provides just 8 grams of sugar, much less than fruit juice; an 8 oz. serving of apple juice contains 27 grams of sugar. Too much sugar can promote tooth decay, and high-sugar drinks may play a role in obesity. Although red cabbage can be more beneficial than whole red cabbage in some ways, the fact that it's liquid can be a disadvantage. Research from the July 2011 issue of "Current Opinion in Clinical Nutrition and Metabolic Care" explains that liquids are less filling than solid foods, so juices may be detrimental for weight management. Red cabbage juice is a rich source of vitamin A, as just 1 oz. provides more than three times the daily suggested intake. Vitamin A helps promote the health of your skin, and it can also ensure healthy vision. In addition, red cabbage provides calcium and vitamin C; an 8 oz. serving of this juice offers more than the daily suggested intake of each of these nutrients. If you consume a lot of red cabbage juice, you may end up consuming toxic levels of vitamin A. According to the Linus Pauling Institute, the tolerable upper limit of vitamin A is 330 percent of the daily suggested intake, and 1 oz. of red cabbage juice contains 316 percent. Consuming too much vitamin A can result in fatigue, headache, nausea and dizziness. Can You Speed Up Your Metabolism With Natural Juice Recipes?